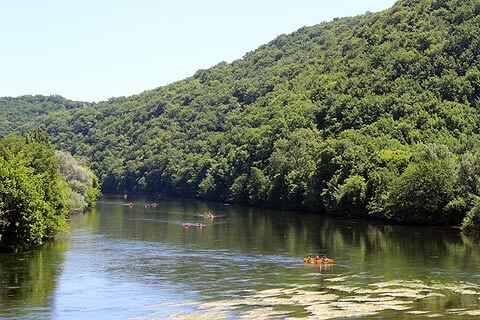 Canoe the Dordogne river: a great day out! 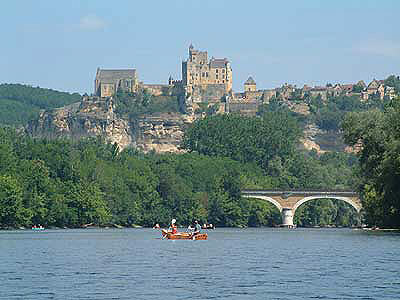 A day in a canoe drifting down the Dordogne River is one of our favourite pastimes. Glide gently past Beynac, La Roque-Gageac and other small villages along the Dordogne, and see beautiful sections of the river that are not visible from elsewhere. 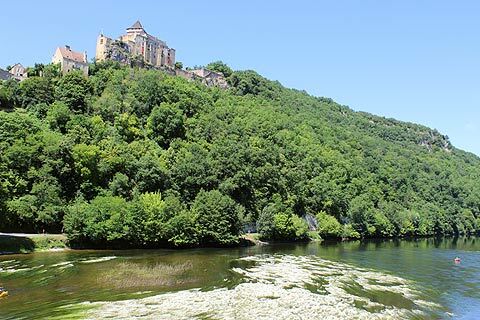 From Souillac or Domme to Beynac see some of the key sites the Dordogne has to offer - the Chateaux of Beynac and Castelnaud, the beautiful villages of Beynac and La Roque Gageac and along the way the plum and walnet orchards and the rocky cliffs glide by. River beaches such as those at Vitrac tempt you to stop for a picnic. Beyond Beynac the river is quieter and the scenery more gentle. 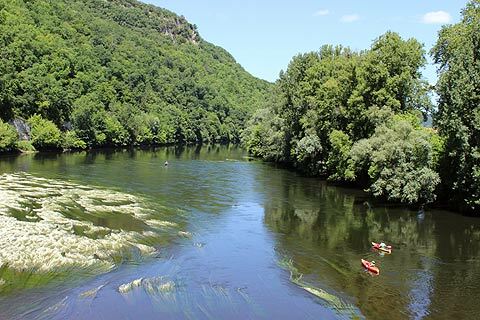 If you can continue to Limeuil and the confluence of the rivers Dordogne and Vezere. Canoeing along the Dordogne is safe for children (lifejackets are provided) although generally not possible with small infants and babies. The hire of the canoe and equipment is reasonably priced and so as a day's entertainment it is good value as well. There are plenty of places along the route where you can pull your canoe over to the river bank for a picnic, a paddle and a sunbathe. A large 'screw top' plastic tub is usually provided to help stop your picnic and camera getting splashed by over-enthusiastic children. At the start, the canoe hire company will usually drive you upstream in a minibus - you can then canoe back downstream with the flow of the river. Alternatively you start your canoeing from the hire centre and finish at a pre-marked location downstream, where a minibus will arrive every hour or so to collect people and canoes and take them back to their cars. The important thing to note is that you are always canoeing with the flow of the river, not against it. Most canoe hire companies also offer a choice of distance, so that you can canoe for just half a day if a whole day sounds too much or too hot (a half day is typically 14km, a full day 28km). It is also possible to get taken much further upstream and to spend several days moving down the river, usually camping en-route. 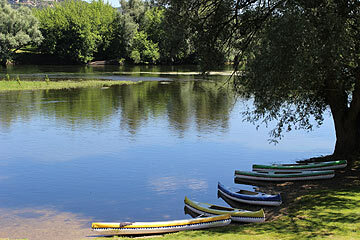 Several canoe hire companies operate along the Dordogne River - your local tourist office will be able to help you find one that is suitable for you - several of the large ones are listed below. 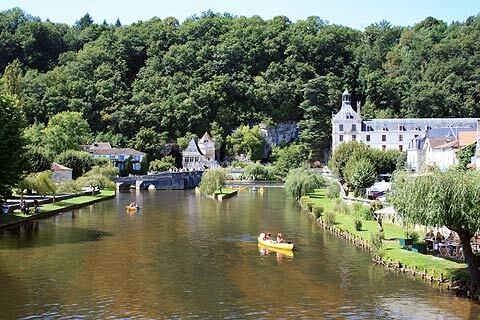 Canoeing on the River Dronne is also possible, usually starting from Brantome. Prices tend to be around 11 euros for half a day (7€ children) or 15 euros for a full day (11€ children). Most companies also offer rates for 2,3,4 or 5 day trips. If you are looking for a relatively leisurely day in a canoe we would recommend you stick to a half-day option (14km) especially if this is your first time or you have children with you. Have a picnic along the way and this makes for a great day out with time to wander into the local village for an ice-cream when you finish. If you are more experienced or more active than a full day (28km) in the canoe is great. Here are some of the bigger companies. In July and August it is best to book ahead. CanoeEric - based inLe Bugue (follow signs for the aquarium, then another 150m). 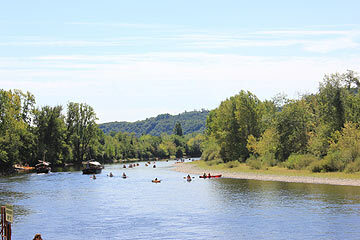 Whilst you can canoe the Dordogne with this company most of their canoes are on the Vezere river - no spectacular castles to see but lovely villages and a more peaceful stretch of river to enjoy.